From a young age I knew that something was not right in my life. Was it the artist in me? Something that my parents didn’t provide? But I’m getting ahead of myself. I remember going to a New England prep school and taking “study habits” in 7th grade. To this day I can’t remember a single thing they taught in the class, but as I got older and in college it dawned on me that no one was teaching this information. You were just supposed to know how to manage your time, break down large tasks, and move forward. My mother nicknamed me “cliff” for “cliff hanger” because I would always put off school things to the last minute. My father, a Type A personality with a sensitive heart, talked to me about success, that I could do anything I wanted to; I could see him just muscle his way through most things. My mother, an intellectual who ended up being a homemaker when she would have preferred to be a professor, could provide knowledge but couldn’t understand me and my emotional needs. So I went at it alone, trying to figure out who I was and how to balance things. They loved me, but they couldn’t provide everything I needed. When I entered college, my life changed dramatically. Previously, I was smart enough to get by on my intelligence alone. Not anymore. I was in a large university for Computer Science and Engineering and the philosophy of the program was likened to medical school. 50% of the class dropped out in the first year due to the workload. I was able to keep up, but no longer as the A and B national honor student in the 99th percentile that I once was. I wanted to be social as well, and I tried to be, but it was getting harder. Sophomore year, I hit a wall. Anxiety attacks, including vomiting on a daily basis and being unable to eat, plagued me. I had reached the limits of my skills. I created my own personal psychological hell. I was actually still able to get As and Bs, but I took it out on myself to meet the standards. The standards had been my identity and now I was losing my ability to meet them, and losing myself in the process. I started to realize that the standards didn’t make sense. Looking back I can see that I had certain patterns that set me up to be a powder keg. It was only a matter of time before something lit the fuse. I had few personal boundaries when it came to time. I didn’t understand balance, managing emotions, having a mission. I didn’t know about having a why, or what my strengths were besides being smart. I was there to “do well so I could be successful” except I had no idea what successful was, but I was pretty sure it was not what I was experiencing. It was in college in the late 1980s and early 1990s that I started searching for these answers. Always a man who talked about integrity, my father introduced me to the Steven Covey books. I started reading psychology books, trying to figure out what my problem was. I was learning about the importance of managing emotions and that some patterns work and some do not. I realized that even though I thought my parents had done something wrong with me, it did not matter — I owned and was living these patterns. After college, I was able to get a job at Microsoft even before I graduated, and I moved to the Seattle area. While I had learned to manage my emotions better, I still had issues. I got involved in the “personal effectiveness” movement. I learned about responsibility vs. guilt and blame. I was growing and I had knowledge, but applying it took time. I was successful at Microsoft and learned a lot, but still had trouble balancing my life. I had learned in college that you needed to govern yourself. I saw people around me pushing to get ahead as they saw people earning a lot of money and retiring. I was able to support myself and accomplish a lot, but being happy was elusive. I wasn’t driving from vision; I was running from something else. Emotionally, I still felt like my head was underwater. In short, I was and still am an artist, but did not want to live the clichéd, tortured life of some artists. I wanted to flow and be alive, but structured enough to be effective. Two parts of me fought it out. I tried a number of other methods as I knew the direction but not how to balance. To everyone around me I appeared to be a well-balanced individual, but I could feel the gap between what I was and what I wanted to be and was capable of. Sum up to say that due to a number of patterns in my life, I was getting in my own way. Along came working for J.D. Meier. I had known J.D. in the 1990s in the Developer Support group at Microsoft. I now had a chance to work with him in the patterns & practices group. While a number of the things I studied helped me, J.D.’s methodology for Agile Results gave me a number of things that I did not have before. I realized that the content and format of Agile Results worked well for what I was trying to do — quickly understand myself as a human system and to tune and improve that system while working with my human and creative aspects. I like Agile Results for many reasons, but here are a few specifics. It’s about results and outcomes. Many books that incorporate feelings are about “feeling better”, but do not focus on outcomes and actually producing something of value. This one combines both in such a way that it can clearly see the connection and how to do both. Previously I would go back and forth between each, sacrificing one for the other. It’s not making me into a small “J.D.” When I read the book, I don’t feel like it is about fitting myself into a system. I feel it’s about tuning my own system to be its best and defining how I measure that myself. It has a “low barrier to entry.” I could implement even a very small part of the system and it would work. That’s what I’ve done actually. I’m probably only doing about 15% of what’s in the book, but I’m building on it. Previously, I just could not keep everything together in other systems to continue to move forward—I would get some parts, but it felt more like juggling balls, often starting right off with 3 of them, not 1 or 2. Since I had issues with trying to do too much at once, beating myself up, and measuring my worth from outcomes, this didn’t work well and I kept falling backwards. Not so with Agile Results. It was simple, easy to process and easy to refer to as a reference. So many other books mix stories into their teachings. I LOVE stories actually, but when I am trying to implement a system, I just need a rollup of the facts to remind me. Separating reference or conceptual information from actionable information was a key that I did not understand before this. And it’s not a linear book, but can be read as one. In many systems, I seem to have to read the whole story to understand it. 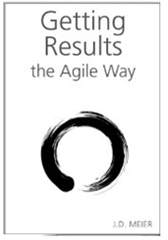 I like the fact that I can jump around in Agile Results and not really get lost or that I can read it cover to cover. Its writing is engineered. The book is written like J.D.’s other books on technical concepts. He’s brought content engineering to the personal realm. The software world is already a combination of art and structure. It’s dense but digestable. J.D. has an uncanny ability to reduce concepts so that they are short, but not reduce them so much that they are abstract and thus harder to understand and process. Splitting out tools like cheat sheets and templates helps immensely in jump starting the whole process. In all, it’s like vitamins and protein bars for the mind and spirit. It took into account the human factor. It dealt with how humans really work from the standpoint of looking at patterns in life and work. Something clicked for me in the parts about closing down work, multitasking, and fully engaging what’s in front of me. I could see the part of having “a why” and how it was important in my own life. The concept of having a “story” was helpful as well. Certainly, some parts I’d heard before as a student of other authors and classes. These principles are not secrets necessarily. However, I don’t remember encountering them stated so succinctly. Has Agile Results “fixed” my life? It cannot do that. This is up to me. But the book has given me a great toolbox for the job. It’s made the process seem much simpler than I previously thought. I can more easily see patterns that do not work and correct them using strategies in the book. I highly recommend it.